Another Beautiful Day in Paradise. It was a little cold and windy but got much better for the Brunch at Rob and Amie's. We did the usual Clearwater Beach skate. Absentees Joe W, Pilot Rob H and Kyle came. New skater Anne H came. Mike M (Mac) came again. Welcome all. Rick indicated we did 11.8 miles. Pilot Rob H renewed his sponsorship. Thanks Pilot Rob H for the web site support. Mac is planning to have a Brunch in March. He and his wife Sandy live on Clearwater Beach so a Clearwater Beach skate would be perfect to have a Brunch at their place. Anne H says she will skate again with us. Amie had been hard at work fixing Brunch while we were out playing. She had this wonderful spread of food all ready for us to eat when we arrived at their house. She also had some OJ and this bubbly stuff to put in it. Several people that didn't skate also made it to the Brunch: Suzanne & James, Deb D, Iara, Mary Beth and Laura. 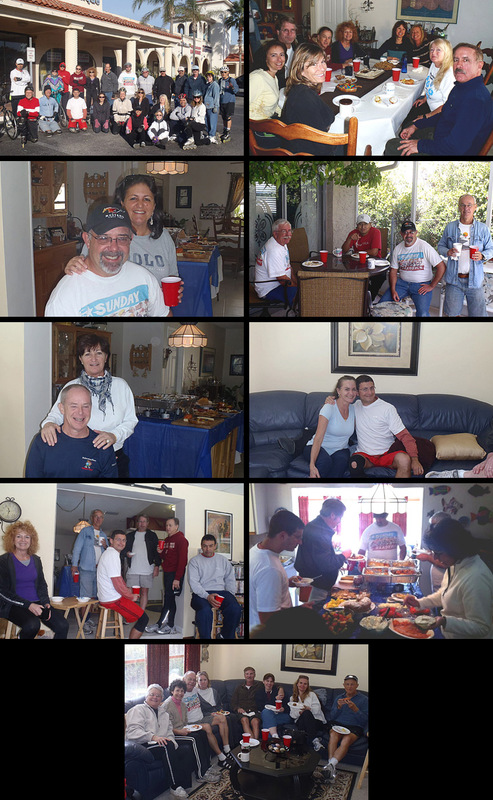 All had lots to eat and plenty of time to relax, enjoy and socialize. Happy Birthday Rob and THANKS AGAIN for having us all to Brunch.